University of Georgia Press, 2010. In Beyond Katrina, Natasha Trethewey has created a rare and important document, even an essential one. 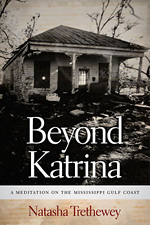 The book chronicles the devastation and aftermath in her home state of Mississippi of one of the deadliest hurricanes ever to hit the United States, and she refracts her account through the lens of her memories of growing up in the predominantly poor and African–American city of North Gulfport. She also draws on her family’s experiences, particularly the poignant and ultimately wrenching story of her younger brother Joe who went to prison for selling drugs, his choices determined by the unrelenting financial pressures he felt as a native son in the devastating wake of the storm. Everywhere I go during my journey, I feel the urge to weep not only for the residents of the coast but also for my former self: the destroyed public library is me as a girl, sitting on the floor, reading between the stacks; empty, debris–strewn downtown Gulfport is me at the Woolworth’s lunch counter—early 1970s—with my grandmother; is me listening to the sounds of shoes striking the polished tile floor of Hancock Bank, holding my grandmother’s hand, waiting for candy from the teller behind her wicket; me riding the elevator of the J.M. Salloum Building—the same elevator my grandmother operated in the thirties; me waiting in line at the Rialto movie theatre—gone for more years now than I can remember—where my mother also stood in line, at the back door, for the peanut gallery, the black section where my grandmother, still a girl, went on days designated colored only, clutching the coins she earned selling crabs; is me staring at my reflection in the glass at J.C. Penny’s as my mother calls, again and again, my name. I hear it distantly, as through water or buffeted by wind: Nostalgia. In some areas of the coast you can still see abandoned buildings, boarded up and spray–painted with the words We are here, We have a Gun, We will shoot. These are reminders of the crimes committed and the actions people took to protect their homes. Burglaries and looting became major problems. Police issued warnings that if anyone was caught committing these crimes, they would receive a mandatory five–year jail sentence. Thieves would prey on houses hoping that they were empty from people evacuating before the storm—businesses as well. Business owners began opening their stores and handing out items. I saw a local store owner crying, saying, “If we don’t give it to them, they will just take it.” Police started allowing people to take things from the stores as long as it was for survival—like food and water. And so, yes, a terrible storm like Katrina did happen, and the impact of its aftermath persists to this day. Yet people like Natasha Trethewey and her brother Joe are somehow able to tell us about it in calm, unwavering voices that communicate perhaps the hardest and most radiant hope there is—the hope that despite all of the loss and the heartbreak, there remain unbreakable and immutable bonds that will prevail in the midst of the worst tragedies. And the people here bear these burdens for the rest of us, even if many are not aware of it. Natasha Trethewey is the author of three collections of poetry: Native Guard (Houghton Mifflin, 2006), which won the 2007 Pulitzer Prize for Poetry, Bellocq’s Ophelia (Graywolf Press, 2002), and Domestic Work (Graywolf Press, 2000). A fourth poetry collection, Thrall, is forthcoming from Houghton Mifflin Harcourt in fall 2012. She is the Charles Howard Candler Professor of English and Creative Writing at Emory University.